Roberto Mazzoni has begun his career as publisher at Mondadori group, the first biggest magazine and book publisher in Italy. There he was responsible for all the computer science magazines published by the group. He was then promoted as publisher for the Internet technology portal Mytech.com, the first Web portal created under the brand Mondadori.com. He was responsible for the concept development and the implementation of the portal as well as for its content. Later he moved to a European wide project and became Content Manager and Publisher for the first mobile 3G European portal sponsored by Telia International, a multinational corporation created by the Scandinavian mobile operator Telia and the Italian Olivetti Group. 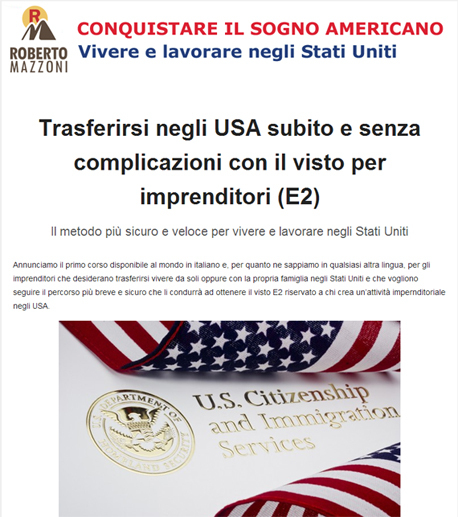 Finally he moved to the United States where he developed and published five different training sites devoted to European and Italian entrepreneurs who wish to invest in the USA. www.aziendainamerica.com provides a complete rundown of all the know-how needed to create and manage a company in the United States. www.foreclose.it provides a complete and extensive training program to those who wish to invest in real estate in the USA. www.vivereinamerica.com guides entrepreneurs and investors through the complex US immigration system and provides them a complete map of the best possible path to follow as well as the tools to develop a complete and compelling business plan that will win the support of immigration officers, partners, lenders and suppliers.